Steve Connolly is the only artist in the world who creates a gallery-quality portrait of Elvis Presley during a live performance while simultaneously singing, painting & physically depicting the King & all in about 10 minutes! Live on stage! A hush descends on Connolly’s audience, as ELVIS comes alive in a huge six foot speed painting portrait, as Steve’s fine art painting tribute to Elvis emerges in a flash, audiences are left breathless. 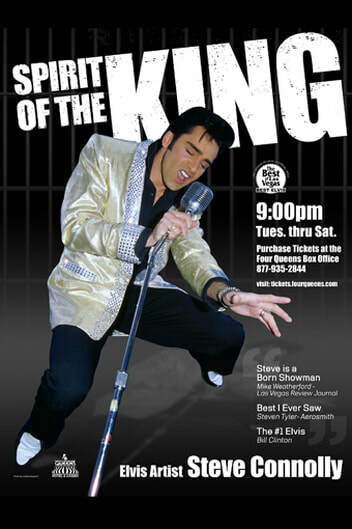 Steve creates a multi-color portrait, that looks out at adoring fans throughout the show, keeping ELVIS CLEARLY IN THE BUILDING.